I am happy to say that these four lovely and all blonde ladies are now part of the Sasha family here at Sasha Shangri-La. As Sasha enthusiasts can see, each one is different from the other and they each arrived over the past year. No excuses for my delays. I just failed to properly introduce them upon their arrival. Though, I have to say, I have really enjoyed each one very much. So, let us begin with introductions. This slate eyed beauty has beautiful and luscious hair. Her name is Holly. 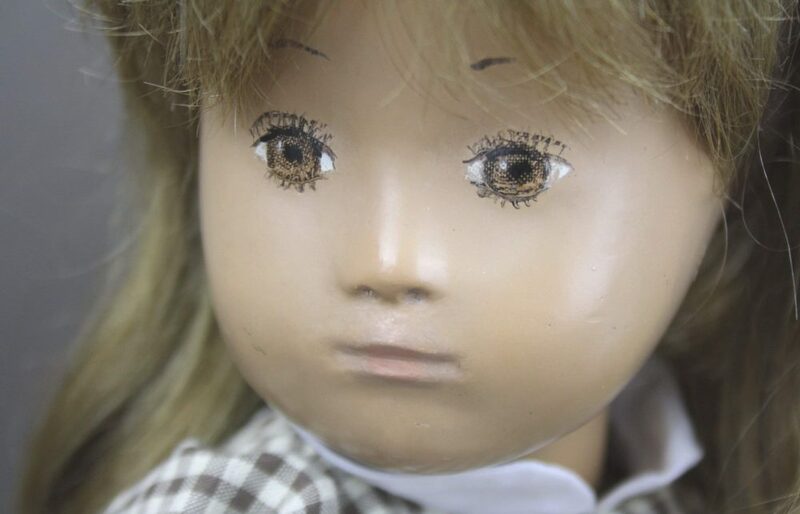 Next is a very special button nose or no nose girl with beautiful ochre eyes. Her name is Ellie. This amazing slate eyed girl has a fantastic pout about her. Her name is Hayley. Lastly, is a pale faced slate eyed girl that is very feminine even with her contrasting bold brows. Her name is Emma. They arrived wearing their original outfits. I wanted to introduce them as they came before safely storing their clothing and beginning to redress them. What fun that will be! Holly is wearing brown cord farm pants and white blouse, white sandals and a green duffle coat. Ellie and Hayley are both wearing a brown cord dress and brown leather shoes. Hayley has her original blue threaded wrist tag which dates her as an early production girl. Emma is wearing a navy and white checked dress with navy leather shoes. It is always nice to have original outfits for our Sasha dolls. A couple of close up photos of sweet Emma. Close up photos of Hayley and her dreamy eyes. Close up photos of Ellie and her beautiful expressions. More photos of Holly, Ellie, Hayley, and Emma. Thank you for visiting with us today as I catch up with the residents of Cow Creek. My photos were taken indoors due to reoccurring rain storms in recent days with alternating high temperatures. It is better to stay inside for now. I hope you enjoyed this post and that you have a wonderful day and week to come. Pretty Waterlogue images to enjoy.